On June 20, 2014, we participated because we know that by raising funds and walking in the American Cancer Society Relay For Life event, we will help save lives from cancer. We want to make noise and help finish the fight! It's overwhelming to think that millions of people will be diagnosed with cancer this year. It might be someone close to us - or you or me. A Relay For Life event is not only a way to join our community to fight back against cancer, but it is also a way to inspire hope by raising funds and cancer awareness to help those facing the disease. Every day, the American Cancer Society helps people take steps to reduce their risk of cancer or find it early, when it is easiest to treat. They provide free information and services to cancer patients throughout their journey. The organization is investing in crucial research to prevent, treat, and ultimately, cure all cancers. We have signed up to walk (or run) and raise funds for the Relay for Life of Tippecanoe County on June 20. We hope you will consider joining our team or making a donation in support of our efforts! You can click here and donate online. A donation jar is located at the Fleet Feet Sports store counter. A BIG THANK YOU to Tekoa Geswein of 2nd Wind Health & Fitness, Parkwest Fitness and all those who participated in this event! The event raised $400 for the American Cancer Society Relay for Life! 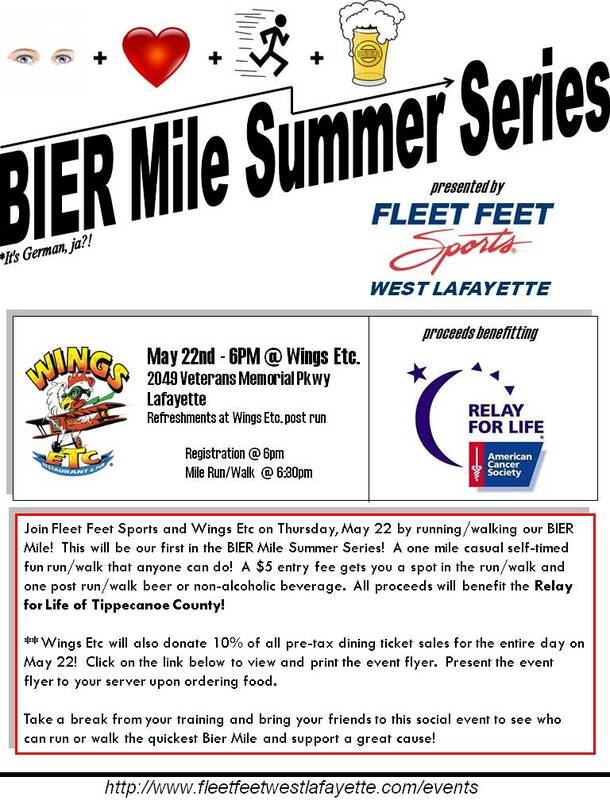 A BIG THANK YOU to Wings Etc, Fleet Feet Sports West Lafayette and all those who participated in this event! The event raised $400 for the American Cancer Society Relay for Life! THANK YOU to Logan's Roadhouse and all those who participated in this event! The event raised $79 for the American Cancer Society Relay for Life! THANK YOU to Chick-fil-A and all those who participated in this event! The event raised $141.95 for Relay for Life! Bidding period was on Friday, June 20 from 6 pm to 9 pm, Jefferson High School track (below the bleachers) THANK YOU to Brooks Running for donating a pair of shoes, shirt and shorts for the silent auction. The Brooks package raised $135 for the Relay for Life!. Join our team! Why should you join Team Fleet Feet? The top fundraiser will win a pair of running shoes and socks! The top Luminaria seller will win Balega socks! Each member who raises at least $100 will receive an exclusive tech t! Join Team Fleet Feet here!